Gen4 hardware offers substantially more memory per vCore. However, Gen5 hardware allows you to scale up compute resources much higher. For information about DTU-based service tiers, see DTU-based service tiers. For information about differentiating DTU-based service tiers and vCore-based service tiers, see Azure SQL Database purchasing models. The vCore model provides three service tiers General Purpose, Hyperscale and Business Critical. Service tiers are differentiated by a range of compute sizes, high availability design, fault isolation, types and size of storage and IO range. You must separately configure the required storage and retention period for backups. In the Azure portal, go to Server (not the database) > Managed Backups > Configure Policy > Point In Time Restore Configuration > 7 - 35 days. 32 GB - 4 TB Flexible, autogrow of storage as needed. Supports up to 100 TB storage and beyond. Local SSD storage for local buffer pool cache and local data storage. Azure remote storage as final long-term data store. Backups RA-GRS, 7-35 days (7 days by default) RA-GRS, 7-35 days (7 days by default) snapshot-based backup in Azure remote storage and restores use these snapshots for fast recovery. Backups are instantaneous and do not impact the IO performance of Compute. Restores are very fast and are not a size of data operation (taking minutes rather than hours or days). You can get a free Azure SQL database at the Basic service tier in conjunction with an Azure free account to explore Azure. For information, see Create a managed cloud database with your Azure free account. For more information, see vCore resource limits in single database and vCore resource limits in Managed Instance. For more information about the General Purpose and Business Critical service tiers, see General Purpose and Business Critical service tiers. For details on the Hyperscale service tier in the vCore-based purchasing model, see Hyperscale service tier. 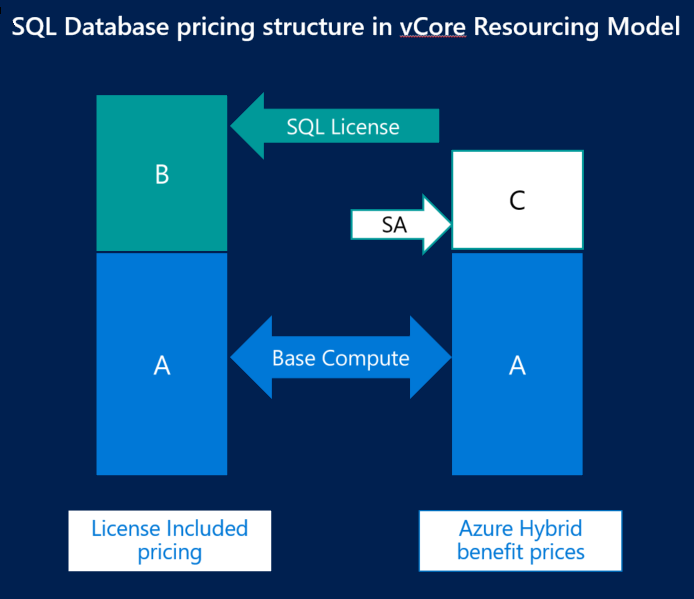 In the provisioned computer tier of the vCore-based purchasing model, you can exchange your existing licenses for discounted rates on SQL Database using the Azure Hybrid Benefit for SQL Server. This Azure benefit allows you to use your on-premises SQL Server licenses to save up to 30% on Azure SQL Database using your on-premises SQL Server licenses with Software Assurance. With the Azure Hybrid Benefit, you can choose to only pay for the underlying Azure infrastructure using your existing SQL Server license for the SQL database engine itself (BasePrice) or pay for both the underlying infrastructure and the SQL Server license (LicenseIncluded). You can choose or change your licensing model using the Azure portal or using one of the following APIs. Migrating a database from the DTU-based purchasing model to the vCore-based purchasing model is similar to upgrading or downgrading between Standard and Premium databases in the DTU-based purchasing model. Migrating from the DTU-based model to the vCore-based model is similar to upgrading or downgrading the geo-replication relationships between Standard and Premium databases. It does not require terminating geo-replication but the user must observe the sequencing rules. When upgrading, you must upgrade the secondary database first, and then upgrade the primary. When downgrading, reverse the order: you must downgrade the primary database first, and then downgrade the secondary. When using geo-replication between two elastic pools, it is recommended that you designate one pool as the primary and the other – as the secondary. In that case, migrating elastic pools should use the same guidance. However, it is technically it is possible that an elastic pool contains both primary and secondary databases. In this case, to properly migrate you should treat the pool with the higher utilization as “primary” and follow the sequencing rules accordingly. Migration of failover groups with multiple databases requires individual migration of the primary and secondary databases. During that process, the same considerations and sequencing rules apply. After the databases are converted to the vCore-based model, the failover group will remain in effect with the same policy settings. You can copy any database with a DTU-based compute size to a database with a vCore-based compute size without restrictions or special sequencing as long as the target compute size supports the maximum database size of the source database. The database copy creates a snapshot of data as of the starting time of the copy operation and does not perform data synchronization between the source and the target. For details on specific compute sizes and storage size choices available for elastic pools, see SQL Database vCore-based resource limits for elastic pools.